Do not miss our Valencia team games list. Valencia is a city of art, culture and surprising sophistication. The City of Arts and Sciences is the perfect metropolis for your company’s next team building activities. Red Mago creates custom corporate events packages that combine unusual and memorable team building events with flawless delivery. For example, what better way for your team to develop its sense of unity then with a day of running with the bulls? Our ‘baby bull running’ event is fun for human and bull alike. Set in our exciting purpose-built arena, groups come together when experiencing this most quintessential of Spanish challenges. It is said that adrenaline sharpens the senses and this activity is a kind of outdoor training course on decision-making! Usually the decision is to run! Valencia team building activities offer spectacular opportunities for your team to discover their group spirit, with Segway tours, sunset cruises and even beach volleyball events. Our operations managers delight in building unique experiences which are tailored to your interests, whether it is a reward for a job well done, or chance for a new team to get to know each other, Red Mago organises corporate events so that your visit to Valencia is perfect. Nothing is more Valencia than the Paella! Try our Paella cooking class and get everyone involved in an evening of food, fun and great Spanish wines as your group goes through the intricacies and secrets of Spanish cuisine. 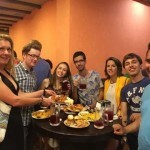 For the gastronomically-minded there’s also our specialised Tapas Tour which certainly will whet the appetite and more. Creative team building events have shown to increase team effectiveness in managing stress, improving communication and increasing performance. With that in mind there is always time for an afternoon of Go-karting just to loosen up those muscles and release your inner Lewis Hamilton. All our events are available with top-of-the-line private transport options to make every activity comfortable. Contact one of our representatives and let Red Mago create a custom events package that makes your visit to Valencia spectacular!